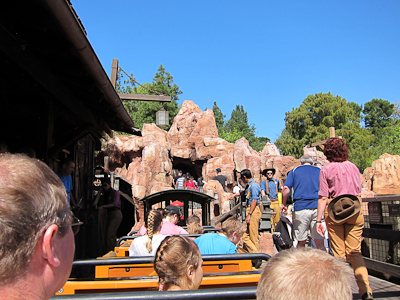 Hold on to your hats and glasses, ’cause this here’s the wildest ride in the wilderness! 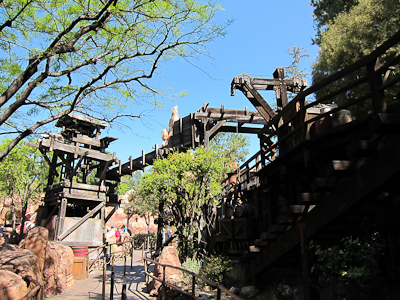 I got over to Disneyland sans child which meant that I could finally go on Big Thunder! 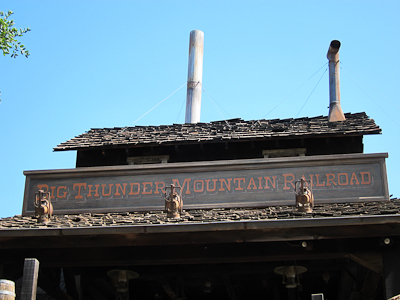 Big Thunder Mountain Railroad is one of the four Mountains of Disneyland. 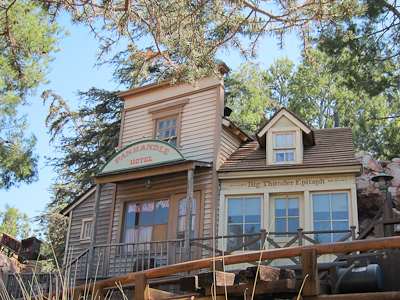 It’s Frontierland’s main attraction. 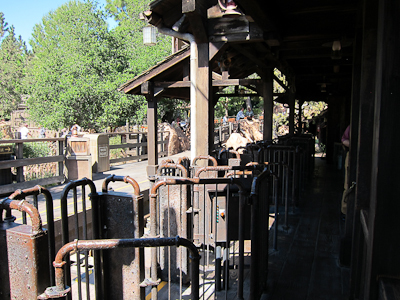 As far as roller coasters go, Big Thunder is a fairly mild one. Little kids tend to LOVE it. It’s like the first Big Kid coaster after they graduate from Gadget’s Go Coaster back in Toontown. 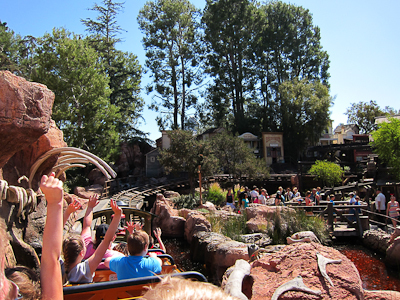 When you come around the bend, you’re in Big Thunderland. That’s not an official name–I just made it up. 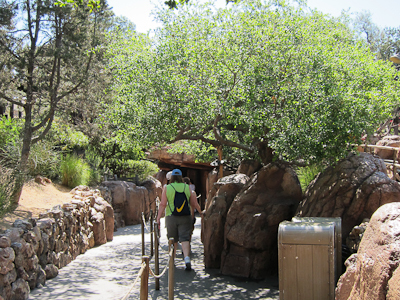 Basically you’re surrounded by the Big Thunder story and can’t see or hear anything else in the park. Nice! It's a working mine shaft! 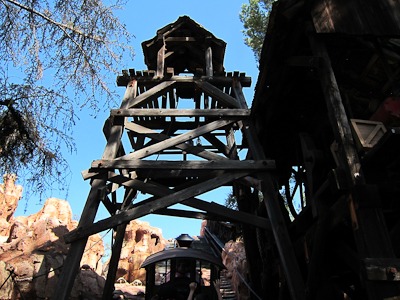 And by working mine I mean this large wooden thing that isn't actually a working mine shaft! 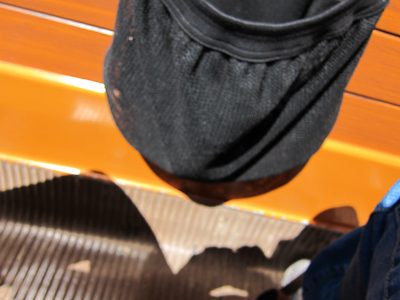 The coaster itself wraps back around the line, so you actually walk underneath it. 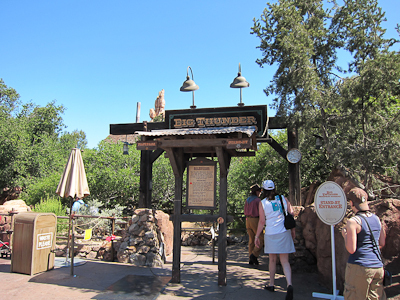 Big Thunderland has got it all, including all of the tools you’ll need on your mountain adventure. I love the little buildings. There’s also a water fountain. I always stop and get a drink here. 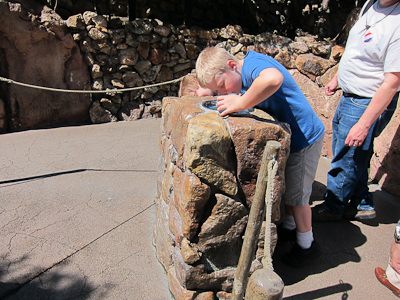 I love the in-queue water fountains. I always take a drink even when I’m not thirsty. No, I can’t explain that. 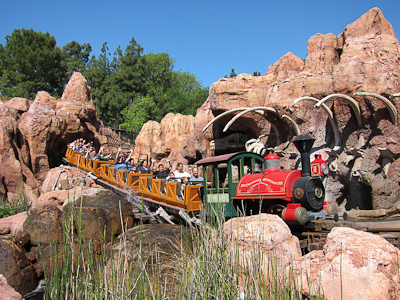 You also get a great view of the train as it runs across various bits of its track. Here is where it goes by a partially excavated dinosaur. 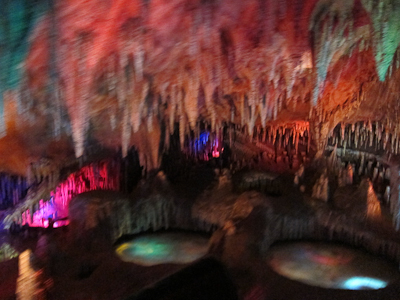 Can you believe there’s a dinosaur skeleton right there in Disneyland? What are the odds??? Go up some stairs and you reach the loading station. They were only loading from one side, so I took a picture of the other. When it’s time to board your train, the seats are a bench with a bar. 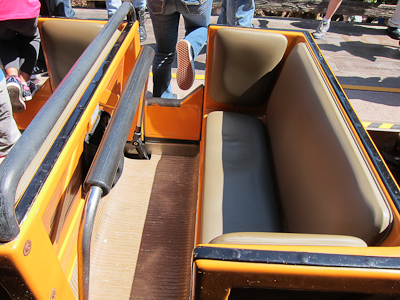 I have to say, this is my one beef with Big Thunder, because if you’re a small person and you’re sitting next to a big person, the bar only goes down to the biggest lap and then you get slammed around. For years I didn’t like this ride for precisely that reason. 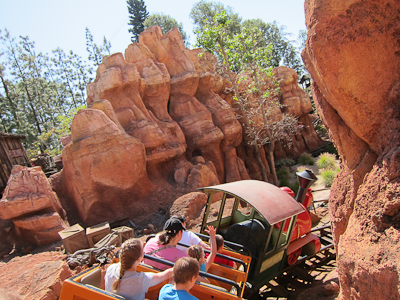 After you click-click-click your way up the hill, your ride begins! I actually took this picture while we were moving! You race along the mountain, up and over hills and valleys, into mine shafts and out again. And then there’s the big hill. And at the top, you will find the goat eating dynamite. And this, my friends, is where you can do the “Goat Trick.” What is the Goat Trick? Excellent question! The Goat Trick is a way to trick your inner ear into interpreting the g-forces of the next turn a different way. How do you do the Goat Trick? Easy! When you see the goat, simply follow him with your head never taking your eyes off of him the whole way around. 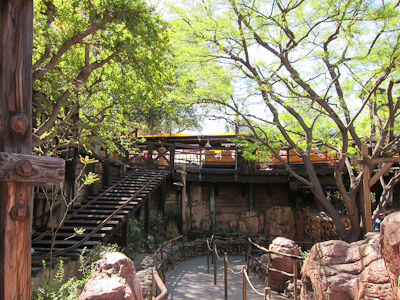 The mechanics of the ride provide a lateral g-force, but your inner ear interprets something else that I’ve heard described across the internet as a “vortex” or “like being flushed down a toilet bowl.” And really, who DOESN’T want to be flushed down a toilet bowl! Apparently sitting at or near the end of the train increases this effect. I have never done the Goat Trick. I have a sensitive stomach and this sounds like asking for trouble to me, but I WILL try it one day–I promise :). However, YOU are more than welcome to try it. Ask to sit in the back and see how it goes. Report back to me when you’re done!! Just sit back and enjoy the fun! And the ride comes to a close. 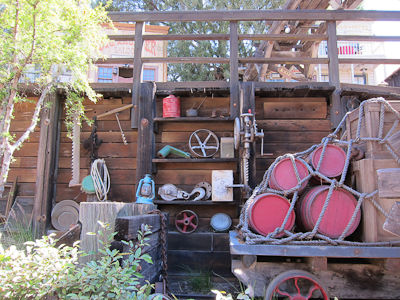 There’s so much more to see on Big Thunder than I photographed here. I particularly love the skunks as well, and there’s tons of details everywhere. If you don’t like roller coasters, don’t be intimidated. 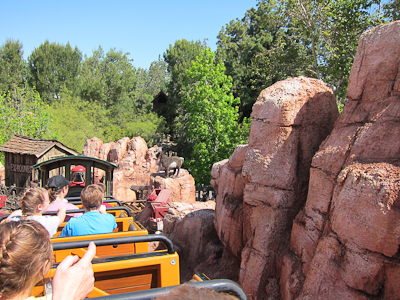 Big Thunder isn’t scary–it’s all about the view!